A 20-year-old man has been jailed after pleading guilty to causing grievous bodily harm in an unprovoked attack on a father and son in Guildford in 2017. Keiran McQuade, of Vernon Way, Guildford, was sentenced to five years in prison at Guildford Crown Court on Thursday (7 February), for the horrific assault, which left one of the victims with life-changing injuries. The 47-year-old and 72-year-old victims were woken around 4.30am on 8 May 2017 by a disturbance outside their house near the Sainsbury’s in Worplesdon Road. Fearing the suspects were going to break in, the pair went out to ask them to leave. However, they were then attacked by the group and beaten repeatedly. The 72-year-old was left with life-changing injuries and now needs regular care. His son also still suffers from the after effects of the incident. Officers made a number of arrests and, following a detailed investigation, were able to charge McQuade for the offence. He was sentenced to three years and two years for each offence, to be served consecutively. Five others who were arrested as part of the investigation have been told they face no further action at this time. 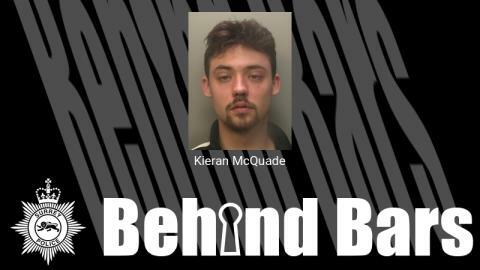 Investigating officer, Detective Constable Simon Tigg said: “This was a horrific and unprovoked attack and McQuade is rightly behind bars where he belongs for this offence. “The victims are still suffering from the consequences of the frenzied attack that day. The 47-year-old victim described the group as ‘pack of wild animals’ in his original statement to police. He added: “When I am thinking about what happened, which is quite often, it is not obvious to me why they did it or why they were acting like they were.